The below three shots are the results of many hours of effort but at the same time falling short on my initial expectations. Perhaps my sights were set too high for the equipment at hand. At the same time - good enough for me to post here - they are not easy subjects for the amateur. The upper shot of the Cat's Eye Nebula shows the outer shell of the Nebula but try as I might I could not bring out the detail from the center - it is just so intense. It is worthwhile searching out a Hubble Space Telescope photo of this nebula - it is both amazing and beautiful. The middle shot of the Owl Nebula did to some degree bring out what I was after - the outer extremely faint halo around the nebula. (This shows up mostly in the OIII emission line). I have shot this target before (2015) and used some of that data in making this one. The lower image is of Abell 31. Although I have put a lot of time into this one, both in capture time and processing time, it most certainly does not jump out of the page at you. It is extremely weak and for the most part, showing very little structure. The OIII center is much stronger than the outer Ha signal. Trying to pull out that Ha shell (by increasing the Ha signal) just increases the noise in the area of the nebula - and makes it even less distinctive. The Cat's Eye Nebula or NGC 6543, is a relatively bright planetary nebula in the northern constellation of Draco, which was discovered by William Herschel on February 15, 1786. It was notably the first planetary nebula whose spectrum was investigated by the English amateur astronomer William Huggins, demonstrating that planetary nebulae were gaseous and not stellar in nature. Structurally, the object has had high-resolution images by the Hubble Space Telescope revealing knots, jets, bubbles and complex arcs, being illuminated by the central hot planetary nebula nucleus or PNN. It is a well-studied object that has been observed from radio to X-ray wavelengths. Surface temperature for the central star is about 80,000 K, being 10,000 times as luminous as the sun. Plus RGB data from last year. Abell 31 is an ancient planetary nebula in the constellation of Cancer. It is estimated to be about 2,000 light years away. 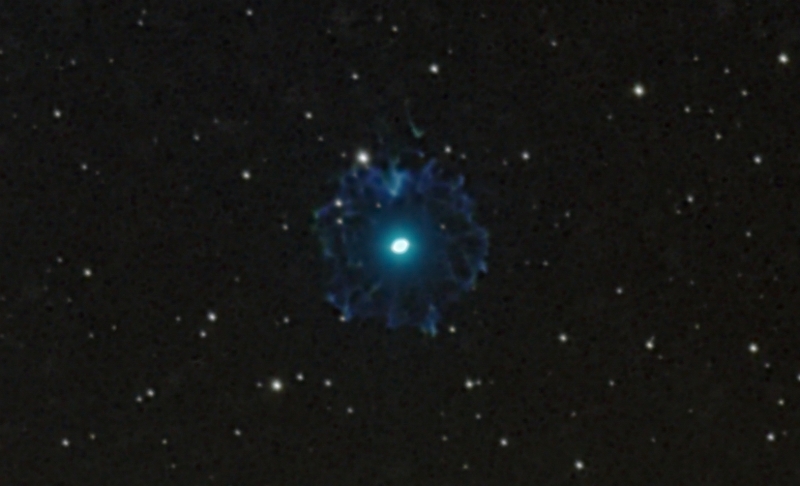 Although it is one of the largest planetary nebulae in the sky, it is not very bright. This may be improved with RGB data - I am not sure. For me it was another difficult object to acquire and process.